UK-based Novation are known these days mainly for making MIDI controller keyboards for computers, but the company first made its name in synths. Novation’s virtual analog synths were beloved for their distinctive sound, accessibility – both in price and ease, and compact design. And some of that legacy, frankly, has been missing in recent years, even with the fun Xio keyboard. UltraNova could be the hardware that brings back Novation’s soul. And the timing couldn’t be better, with a rekindled love for hardware synths even among dedicated computer users. As the name implies, the UltraNova recalls Novation’s best-loved synths, the SuperNova and SuperNova II. Novation have brought back some of the spirit of the previous synths quite literally, with the design work of Nick Bookman (more on that soon). They’ve hit an absurd price point for what they’re promising, with a street anticipated around $699 here in the US. The UltraNova combines the kinds of tasty features people like – single part virtual analog synth with wavetables, effects, bus-powered USB and USB audio, software editor, and built-in arpeggiator and vocoder. But it also has a novel, touch-sensitive set of rotaries for editing. 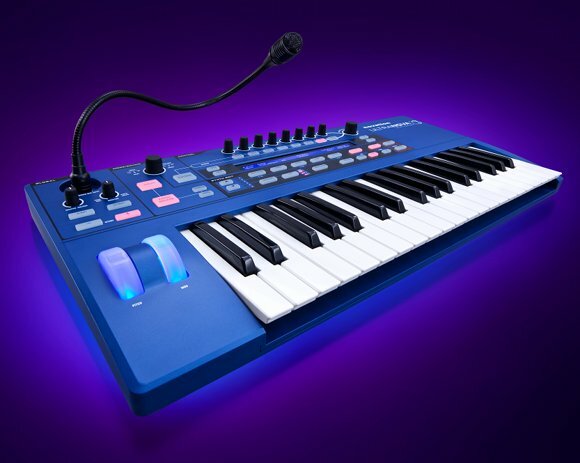 And while there’s plenty of competition in the entry-level synth category, from boutique offerings from Dave Smith to big-name entries from Korg (MicroKORG II) and Roland (GAIA SH-01), I think the UltraNova’s feature set could make it a major competitive force. Below, check out a high-resolution (1920px) gallery of the new instrument. Spec breakdown and promo video after the jump. 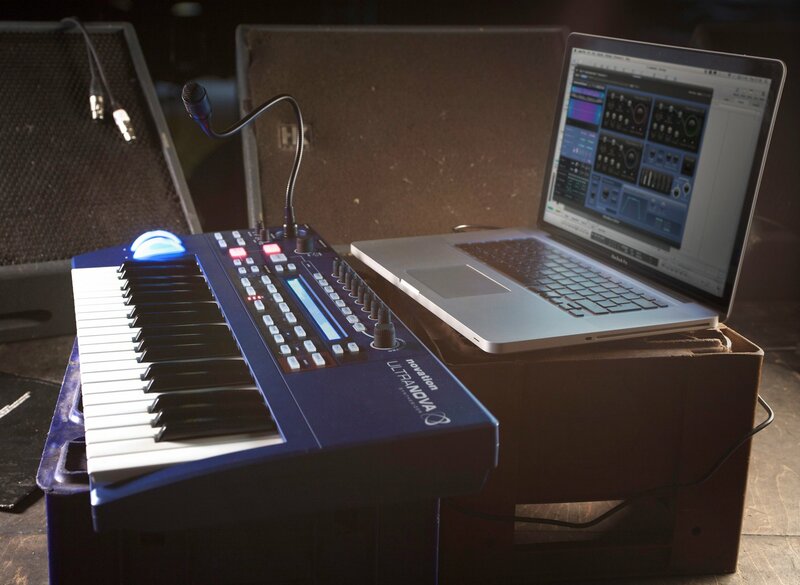 Image courtesy Novation; exclusive to CDM, a look at the UltraNova next to a MacBook and away from the Matrix-white vacuum of product photography, so you can visualize it a little better. Good-quality keybed: The UltraNova uses a 37-key, Fatar-made keybed. I think Fatar makes some of the best beds out there. (I need to check with them on which variety this is, but I believe it’s one of the semi-weighted synth actions.) And it has channel aftertouch. FX: distortion, chorus/phaser, delay, reverb, and gator plus compression and EQ. USB, with bus power. Not only is there USB MIDI and two-in, four-out USB audio, but the entire keyboard runs (quite amazingly, I think) off bus power – no dongle needed. It’s also class-compliant, Linux users / people who hate drivers. Sensible I/O: Balanced line-level and stereo S/PDIF outputs, plus MIDI In, Out and Thru ports. Look for that on similarly-priced synths — and good luck. Those touchable rotary controllers. Perhaps learning from the kinds of controls available on MIDI controllers, editing is available via eight, instant-access “touch and tweak” controls. In a unique move, these rubber encoders are also touch-sensitive, which effectively makes them buttons as well as encoders. There’s also a big knob for fine control of any parameter. It’s a clever arrangement, and I’m eager to try it. Free software editor. If you like to be able to manage patch editing onscreen and not just on the front panel, free Mac/Windows editing software is available as an aid. It’s not necessary, but it does make use of your screen (as seen running on the MacBook Pro above). UK: RRP £587.49. Estimated street price £499.99. USA: SRP: $849.99. At dealers for $699.99. DE: UPE €679.99. EST €599.99. I must say, this is the most I’ve been excited by a Novation product in a long time. Stay tuned. The UltraNova ships in Q4. Novation promo video below (and yes, this is some of the folks at Novation trying to show it off)!